Funded by Area Solidarietà Alitalia in March and in November 2012. All funds transferred directly from the donor to the Buddha Kasettra School. Unfortunately the school has experienced some small robbery and the little girls have experienced some harassment from external malicious persons. A protection wall was constructed around the school to prevent malicious persons to enter in the dormitory of the girls and the school buildings. Thanks to this project the children and the school premises are now more safe and protected. In November 2012 ASA also confirmed their support for the second component of the project proposal: the renovation of two dormitories for the girls. In this way, 40-50 girls are now able to sleep in a safer and more comfortable place, with bathrooms and showers. They no longer have to walk away from the dormitory at night to go to the bathroom, with rain and in the dark. The renovation works started in April 2013. 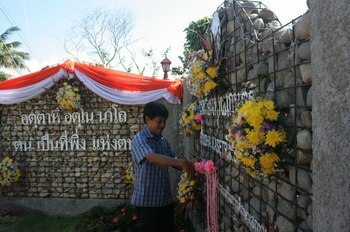 The inauguration of the wall and the dormitories was held in November 2013. Funded by Fasting For Food group. Approved in October 2011, first funds delivered in October 2012, second installment on October 2013. Through this project , children of the School, some of their families and teachers will learn how to use the organic rice and vegetables they farm not only as food but also as source of income. The school and its children cannot always depend on external donations to sustain themselves; but they can always count on their skills and knowledge. In December 2012, teachers, farmers and some kids learn through first hand experience at some model farms in the North of Thailand and, once back to Khun Yoam, spread the knowledge within the School, to other 4 schools in the area and in the network of organic agriculture. Currently they are busy preparing the business canvas for the School, which will be revised and then implemented in 2014. Thanks to this project the children of the Buddha Kasettra School now have a functional and operational computer laboratory. Although it might appear not a first need, at least not as urgent as food, medication or clothes, computer skills represent additional possibilities for these children to find employment and access advanced education in the future. If you are reading this information through the web, we are sure you will easily agree with this. 16 laptops were delivered to the School thanks to "dootrips".